Oak Tree Road in Central New Jersey is the largest Indian business hub in America. There's nothing like Oak Tree Road even in California or New York. Folks, the only rival to Oak Tree Road for the Indian experience is Mera Bharat Mahaan. No wonder Indians from Maine to Virginia flock to Oak Tree Road for buying jewelry, clothing, pooja items and gorging at its huge number of desi restaurants. To the unaccustomed eye, the sheer number of Indian stores on the narrow Oak Tree Road with their displays of jewelry, Saris, Pooja items, Bollywood Cinema Posters, Food and Sweets might seem like Diwali come early. Over weekends, Indian families descend on Oak Tree Road in Edison and Iselin in BMWs, Toyotas, Nissans and Honda Pilots. They visit the beauty parlor, bite into spicy Samosa Chaat, get a pretty dress for a cousin's wedding, stock up on grocery, see a Bollywood or Tollywood movie, meet their attorney to discuss the Green Card or H1B application, a traffic violation ticket, DUI/DWI violation or fight a deportation order, or consult a doctor about IVF, hymenoplasty, labiaplasty, controlling diabetis, talk to a realtor about buying your dream home, visit a home improvement store or the desi insurance agent for a car insurance policy or auto shop for NJ DMV inspection or buy Diwali lamps, Hindu puja items, glittering gold jewelery or home and kitchen improvement hardware kits. But it's the large collection of Indian restaurants offering buffets, Thalis and platters that lend Oak Tree Road its fame these days. Whether it's North Indian or South Indian, Gujarati Thali, Punjabi, Chettinad Curry, Andhra Dum Biryani or Rajasthani or Jain food, Vegetarian or Non-Vegetarian buffet, Chaat or Sweets, Oak Tree Road in Edison and Iselin panders to every Indian culinary craving. 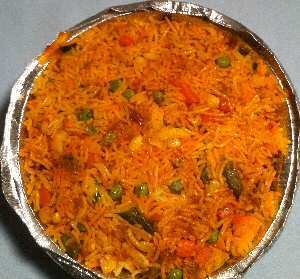 Unlike Indian restaurants in other parts of New Jersey that attract both Indians and Americans, Edison and Iselin restaurants around Oak Tree Road are mostly patronized by desis. 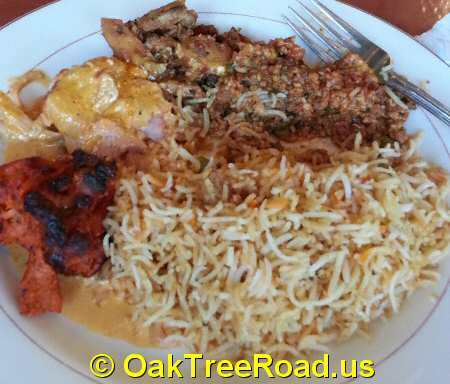 Walk into any Oak Tree Road desi restaurant and you'll hear a babel of Indian voices. If you have a sweet tooth or looking to buy mithai, pastries, egg-less cakes as part of celebrating Christmas, Holiday Season or Diwali Festival of Lights, not to worry. Oak Tree Road and surrounding streets have several Indian mithai stores like Jassi Sweets, Sukhadia's, Anmol, Quality Sweets, Tabaq Sweets, Moghul Sweets and Shalimar Sweets stocking Bengali, South Indian, Gujarati and Punjabi sweets to pander to your Mithai cravings. By the way, a lot of Indian businesses on Oak Tree Road are closed on Mondays. Make sure you call the business first if you plan on visiting the area on Mondays. Whether you're craving Chicken Biryani, Masala Dosa, Jalebi, Samosa Chaat, Mirchi Bajji, a glass of cold Mango Lassi or piping hot Madras Coffee on Oak Tree Road or seeing the latest Bollywood film, start your exploration of Little India with OakTreeRoad.us.